Man, these boots were made for walking.... and dancing the night away. If you think the Aria style looks like it just stepped out of a ‘70s club, you’re not far wrong. Its maker – Terry de Havilland – was (and still is) an icon of the era, with the likes of Bianca Jagger and David Bowie stepping into his shoes. 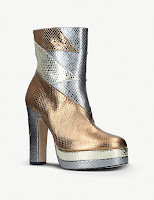 Cloaked in metallic snake-effect leather, this pair is pretty rock’n’roll if you ask us, so you’re best to style them with a leather jacket and mini skirt for good measure.